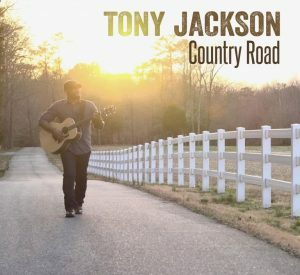 Nashville, TN – The most talked-about singer on Music Row today, Tony Jackson, returns to radio this week with his latest single, “Country Road.” Jackson takes the James Taylor classic and rocks it up with the help of special guests and Nashville’s top session players including: John Sebastian (Lovin’ Spoonful/Rock and Roll Hall of Fame), Garry Tallent (Bruce Springsteen’s E-Street Band), George Marinelli (Bonnie Raitt) and members of Vince Gill’s band and the Time Jumpers, Paul Franklin and Billy Thomas. Jackson delivers the track with the same fire and gusto that brought the crowd of 4,000 to their feet at his recent Grand Ole Opry debut. To-date Jackson has garnered over 62million views and 1.15 million shares on Facebook and YouTube. The song is the first single from his forthcoming album release and was produced by Donna Dean Stevens and Jim Della Croce.